The expression “Engels’ Pause” was coined by Robert C. Allen and refers to the period of real wage stagnation or low real wage growth in Britain in the early 19th century from about 1800 to 1840, even when real per capita GDP was rising in an historically unprecedented manner. You can see the “pause” in the graph of historical British real wages and per capita GDP per worker here. First, it is important to note that some economic historians have challenged the data on GDP and real wages in this period. For example, Gregory Clark (Clark 2001; 2005 and 2007) argues that GDP has been overestimated and real wage growth in the early 19th century underestimated, so real wages did in fact grow more than per capita output growth (Allen, “Engels’ Pause,” p. 2). However, for the sake for argument and to make it easy for Marxists, let me assume that the data used by Allen is correct: that Engels’ Pause was real. However, we now know that this was very much a short-term trend in the history of capitalism and that, after the 1840s, capitalism – even in its inefficient 19th century form – caused real wages, even of workers, to soar above the levels of the early years of the 1800s. Allen (2007) examines this issue and has some interesting insights. Essentially, not only Marx and Engels but also the earlier Classical Political economists like Ricardo and Malthus were misled by this short-run trend, and they all concluded that capitalism would lead to wage stagnation for workers (Allen, “Engels’ Pause,” p. 1). “Among economists, Ricardo, Malthus, and Marx all believed that real wages would remain constant during capitalist development. They differed, however, in their explanations: Ricardo and Malthus believed that population growth would accelerate in response to any rise in income and ultimately force wages back to subsistence; Marx, on the other hand, believed that technological progress had a labour saving bias that would eliminate any upward demand pressure on wages even as output per worker surged.” (Allen, “Engels’ Pause,” p. 1). “While the classical economists all expected the real wage to remain constant, they disagreed about the reason: Malthus and Ricardo emphasized the growth of population, while Marx emphasized the labour saving bias of technical change.” (Allen, “Engels’ Pause,” p. 5). This is an important point: Marx and Engels also thought that wages would stagnate, but they rejected Malthusian population theory (on this, see here; see also Marx 1922 : 40). However, Marx still held that wages would tend towards the value of labour-power: that is, the value of the maintenance and reproduction of labour, with only two additional qualifications as explained in Chapter 6 of volume 1 of Capital. (2) sometimes a “historical and moral element” which as Marx explains in Value, Price and Profit (1865) was mainly a legacy of the pre-capitalist national differences in standards of living. However, for Marx, the “historical and moral element” is clearly not greatly above the level needed for subsistence and reproduction of workers, and in Value, Price and Profit Marx seems to imply that capitalism will reduce even the “historical and moral element” and, generally speaking, will tend to keep wages to a minimum. “labour-power is bought and sold at its value. Its value, like that of all other commodities, is determined by the working time necessary to its production. If the production of the average daily means of subsistence of the labourer takes up 6 hours, he must work, on the average, 6 hours every day, to produce his daily labour-power, or to reproduce the value received as the result of its sale.” (Marx 1906: 255). It is the same in Chapter 11 where wages are “the value of labour-power” which is “therefore the part of the working-day necessary for the reproduction or maintenance of that labour-power” (Marx 1906: 331). We can also see this view more starkly in Marx’s Critique of the Gotha Program where Marx says that in capitalism wages are set so that the worker “is only permitted to work for his living, i.e., to live” (Marx 1922 : 40; see appendix). So the crucial point is: even Marx and Engels, like Ricardo, thought that capitalism would tend to keep real wages to a minimum, even if for different reasons. Allen points out that from 1780 to 1840 British real wages increased by only 12%, even when real GDP per worker rose by 46% (Allen, “Engels’ Pause,” p. 1). Again, a graph of the data on real wages and per capita GDP per worker can be seen here. 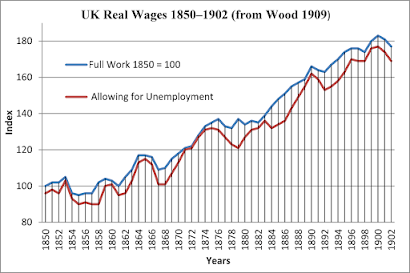 After 1840, however, real wages began an upward trend and living standards soared. Now Lewis (1954) argued that the greater share of income to capital in the 1800–1840 period allowed capital accumulation and that the flow of migration from the country-side contributed to holding down real wages (Allen, “Engels’ Pause,” p. 4). “Although Lewis’ model was inspired by the classical economists analysing the British industrial revolution, the emphasis he placed on surplus labour is hard to reconcile with British history. As a general matter, surplus labour in the countryside is difficult to reconcile with a positive wage. In addition, there are particular problems to applying it to the British industrial revolution. British agriculture did not function as source of surplus labour that kept wages down. For one thing it was too small. In 1801 only 36% of the work force was in agriculture (Deane and Cole 1969, p. 142) compared to the 75–80% that characterized the less developed countries Lewis was describing. Moreover, contrary to Marx, the parliament enclosures did not drive workers from the land; indeed, the poor law (through the Speenhamland system) paid men to stay in the countryside and reduced rural-urban migration. … This does not square with Lewis’ scenario.” (Allen, “Engels’ Pause,” p. 4). Instead, Allen explains the two stages of capitalist development in Britain with the view that accumulation of capital and productivity growth in the early 1800s were out of balance, and that technical progress was labour-augmenting (Allen, “Engels’ Pause,” p. 11–12). “The transition from the first stage to the second, which occurred around the time of the publication of the Communist Manifesto (1848), provides a wry commentary on Marx’s expectations. The acceleration of productivity growth did, indeed, shift income from workers to capitalists, as he expected. The result, however, was not continually increasing immiseration, for the capitalists invested a portion of their extra income and the increase in the capital stock eventually allowed rising productivity to be manifest as rising real wages. History did, indeed, exhibit a stage pattern of evolution, but the stage of flat real wages was followed by the most sustained rise in real wages ever seen–not by socialist revolution.” (Allen, “Engels’ Pause,” p. 12). Allen suggests that the rising demand for capital investment pushed up the rate of return and capitalist profits, which suppressed wage growth. This changed after 1840. Whatever the merits of this explanation an important point still emerges. It still follows that Marx and Engels generalised from limited data on wages and made a hasty and inaccurate inference about the trajectory of capitalism. Marx was guilty of a type of fallacy of hasty generalisation on the basis of Engels’ Pause. 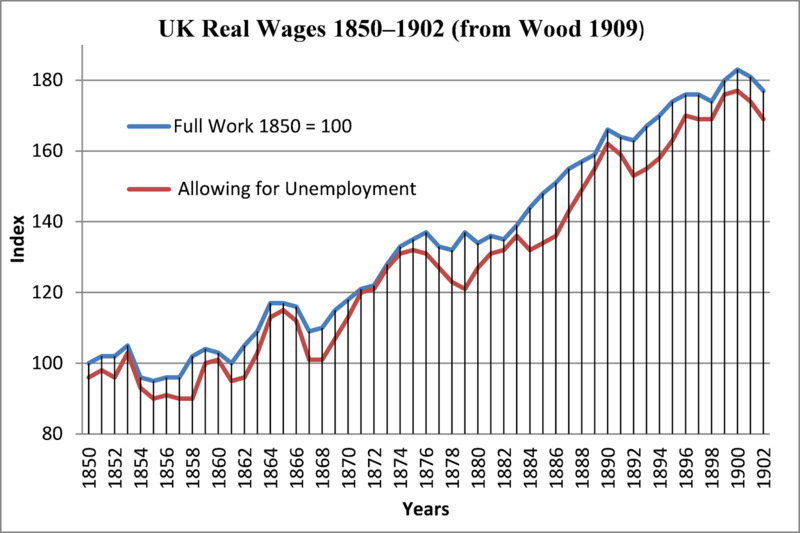 We can see this clearly in the graph below using Wood’s data (Wood 1909: 102–103, Appendix) on UK real wages from 1850 to 1902, constructed from the wage data for working people in a whole range of industries. As we can see, after 1848 living standards soared. Even if we assume wages were at subsistence levels in 1850, it is clear that by 1900 they had risen well above that level. It seems that already in the 1870s Marx’s socialist critic Eugen Dühring accused Marx of falling to take account of the rising standard of living (see Fabian 2011: 463, citing Dühring 1875). It is now perfectly clear that Marx’s theory of wages – that wages would tend to “the value of labour-power” which is “part of the working-day necessary for the reproduction or maintenance of that labour-power” (Marx 1906: 331) – was proven false even in the 19th century and even by gold standard capitalism, which was certainly more unstable and inefficient than the far more dynamic, efficient and stable forms of mixed economy capitalism developed in the 20th century. Marx’s Critique of the Gotha Program was based on a letter he wrote in 1875 and was published in 1891. “Since Lassalle’s death the scientific knowledge has made way in our party that wages are not what they seem, namely, the value or price of labor, but only a disguised form for the value of price of labor-power. Thereby the whole capitalist theory of wages, hitherto prevailing, together with all the criticism hitherto directed against it, was once and for all overthrown, and the fact clearly established that the laborer is only permitted to work for his living, i.e., to live, so long as he works a certain time gratis for the capitalist (hence also for those who share the surplus-value with the latter); that the pivot around which the entire capitalist system of production turns, is to increase this unpaid labor either by lengthening the working day, or by developing the productive powers of labor, or by straining the laborer to more intense exertion, etc., etc. ; that, therefore, the system of wage-labor is a system of slavery, and indeed slavery, which, moreover, grows harder in proportion as the productive powers of labor are developed in society, no matter whether the laborer’s pay is better or worse.” (Marx 1922 : 40–41). “The Debate on Marx’s View of Wages in Capitalism,” January 12, 2016. “Marx and the ‘Iron Law of Wages,’” December 29, 2015. “Engels on Subsistence Wages,” December 21, 2015. Clark, Gregory. 2005. “The Condition of the Working Class in England, 1209–2004,” Journal of Political Economy 113: 1307–1340. Clark, Gregory. 2007. “What made Britannia great? How much of the rise of Britain to World Dominance by 1850 does the Industrial Revolution explain” in Tim Hatton, Kevin O’Rourke, and Alan Taylor (eds. ), Comparative Economic History: Essays in Honor of Jeffrey Williamson. MIT Press, Cambridge. 33–57. Fabian, George. 2011. Karl Marx: Prince of Darkness. Xlibris Corporation, US. Lewis, William Arthur. 1954. “Economic Development with Unlimited Supplies of Labour,” Manchester School of Economics and Social Studies 22: 139–191. El marxismo es un virus que corroe la inteligencia! LK, this post is the first one i read from you on Marxism that is worth something. Why? Because you've finally started to deal with the central issue as opposed to the simplifying assumptions like the labor theory of value (which is passable given that labor intensities don't differ much among industries) or the aggregation of labor (which is passable given that relative wages among different jobs tend to be relatively stable). Welcome to the real world! I've forgot to say: now that you're discussing the real world, you should deal with obvious possible counterarguments, such as the existence of "open frontier" in new world and massive emigration from Europe to there.